Butcher Hollow (or Holler as it is referred to on the rock in the picture above), is not a town, it's a place, nestled in the hills of eastern Kentucky. The nearest town is Van Lear, population about 1,000. The next biggest town is probably Paintsville, about 4,000 people. Van Lear was established as a town by the Consolidated Coal Company in 1909 and named for Van Lear Black, a member of its board of directors. This area of Kentucky is famous for it's coal mines, hard working people, astounding poverty, and Loretta Lynn. 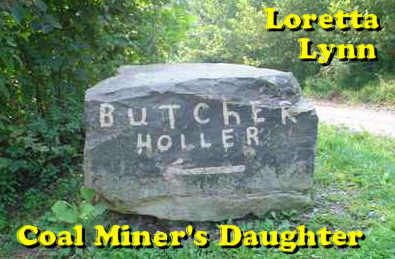 If you've ever seen the movie "Coal Miner's Daughter" with Sissy Spacek and Tommy Lee Jones, you know about Butcher Holler. I was on a road trip through Kentucky when I heard that Butcher Holler was just a short drive away. Having seen the movie several times, I could not resist finding the real thing. The directions seemed simple enough.... go south on U.S. 23 (a National Scenic Byway named the Country Music Highway) to just south of Paintsville. From U.S. 23 take Highway 321 to Kentucky 1107. Follow the signs to Loretta Lynn's Homeplace. riiiiiight. We found Paintsville without any trouble. We found Van Lear. I'm not sure that we ever found the other roads mentioned.... In Van Lear you are supposed to stop at Webb's General Store (No. 5 Country Store on Kentucky 302 near Miller's Creek just past Van Lear) and get in contact with Loretta's brother Herman. He gives tours of Loretta's home for $5 a person. It was a Sunday.... we couldn't find him. From what I was told tho, if you do find Herman he takes you out to Butcher Holler and gives a great tour. Not daunted by this setback, we just started driving around looking for the signs to Butcher Hollow. It's a small place, how hard could it be to find? I will say the scenery is beautiful. Being from the big city, I was enjoying this trip through Kentucky very much. Everything is so very different from what I am used to. After a half hour or so, we spotted the first Loretta Lynn sign. We continued on the road until we were sure we were lost... then another sign. And just when I was saying maybe we need to go back, there it was! Butcher Holler. By this time, everyone in the car was singing "Coal Miner's Daughter" and taking pictures from the road. I really wish we had found Herman Webb, I would have loved to have gone inside for a tour. It really was just like in the movie... the trip was worth the time it took to find Butcher Hollow. I am planning to go back to that area next fall (2005), hopefully we'll get the tour and I'll have pictures inside the house for you then. Loretta Lynn is a country music legend whose life story, as told in her 1976 autobiography Coal Miner's Daughter, is almost as well known as her music. Born and raised in the poor coal mining mountains of Kentucky, she was married by the time she was 14 years old to Oliver V. "Mooney" Lynn, also known as "Doo." After having six children, she began singing professionally in the late 1950s. In 1960 she had her first hit, "Honky Tonk Girl," and by the 1970s she was the richest woman in country music, famous for her working-class appeal and the defiance shown in such songs as "You Ain't Woman Enough (To Take My Man)," "Before I'm Over You" and "Coal Miner's Daughter." Lynn also found great success singing duets with Ernest Tubb ("Mr. and Mrs. Used To Be") and Conway Twitty ("Louisiana Woman, Mississippi Man"), and in business ventures that included a chain of western wear clothing shops, a music publishing company and a traveling rodeo show. Her autobiography was a bestseller and was made into the movie that won Sissy Spacek an Oscar for Best Actress (Tommy Lee Jones portrayed "Doo" in the movie). Inducted into the Country Music Hall of Fame in 1988, Lynn took time off from her career in the 1990s to care for her ailing husband, who died in 1996. In 2004, she released a critically acclaimed album, Van Lear Rose, produced by rocker Jack White of The White Stripes.